The features for the social network differs from the features the casual user of the site sees. (E.g. Users hitting Yelp via SEO usually don't notice that the reviewer is a "Yelp Elite" if they just want to know hours of operation). 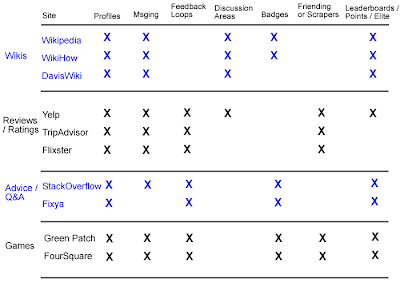 I have tried to map some of the basic social gaming mechanics against types of UGC sites. a) Some things you would assume are important for social dynamics are not. E.g. "friending" (the ability to add other users as friends) is not needed for Advice/Q&A type sites. People are more motivated by reputation and public knowledge display then by who their friends are. b) There are clear patterns of features associated with each type of site (e.g. Q&A site vs wiki). It is unclear if this is due to sites copying features from one another, or whether there is a single canonical set of features needed to prime the right social mechanics for a type of site. 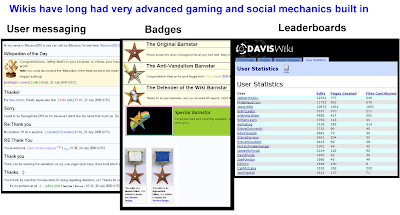 c) Wikis have had advanced social mechanics for a long time. Sites like Stack Overflow or FourSquare are heralded for their gaming mechanics (and I like both products quite a bit), but wikis are really the unsung pioneers/heros of this stuff. Ping me if you have other type of UGC sites with embedded social networks I dont have here. Let me know what you think!